Do you want to Rewrite you article or document and make it look a real content again with a simple flow of words and 0% Plagiarism with no traces of the actual content in the Rewritten article and still passing the similar message and the idea of original content? Then you’re exactly at the right place. 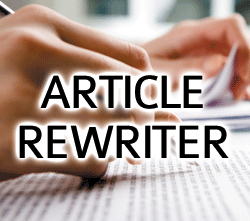 Rewriting is my Hobby and I can rewrite your Articles with error free results without the applying of any spinning software. You’re paying for manually Rewritten content, not spun out computed text from automated rewriting tools. Looks like a unique, new and original content again! So order now &receive your article manual Rewritten. manually rewrite your 2 x 500 words articles for any topic is ranked 5 out of 5. Based on 17 user reviews.